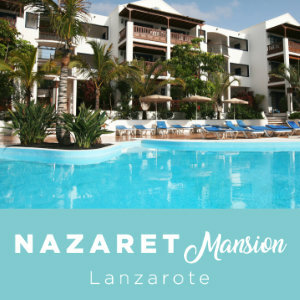 To enjoy good food, entertainment, relaxation and tranquility. Open from 8:00h. to 22:00h.Security guard from 22:00h to 7:00h. He will do check in for guests arriving after 22h. Rent a car service, excursions booking, etc. Deckchairs and mats at your disposal. 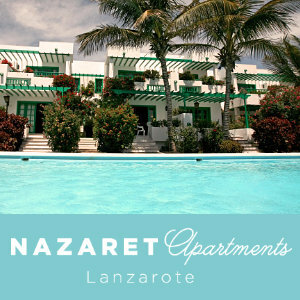 All guests can use the swimming pools of the apartments Nazaret Apartments y Nazaret Mansion. Pool –Bar: Snacks, hamburgers, chips, drinks, etc. Wifi Zone and computers connected to Internet via ADSL. You will find a welcome bottle of wine in the apartment on the day of entry. Fresh bread is placed every morning at the door of your apartment. Enjoy the free time, disconnect, let go, share a time of relax with friends or family or just rest.